Everybody using internet is aware of the power of Google.Google is everywhere whether its search engine, email, social networking, online marketing, blogging etc. But most important of all these is it's search engine which share approximately 60% of all searches made all over the world.This explains the importance of rank SERP (Search Engine Results Page) fo Google.The higher the ranking on SERP the more free visitors you will get from Google. While displaying the results for a particular query Google takes into consideration a lot of factors. Now here comes the importance of Google PageRank. 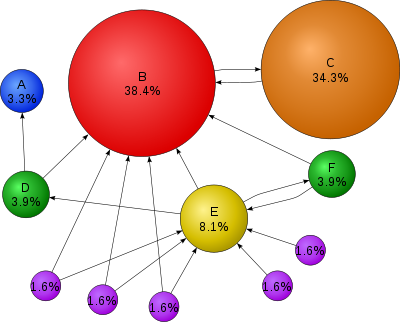 According to Google - PageRank is Google's view of importance of a webpage. Pagerank is given out of 10. Thus a webpage with a higher pagerank will be more important in view of Google as compared to the one with lower pagerank. Hence, a webpage with a better pagerank will get higher position in the SERP. e.g. A webpage with Google PageRank of 5/10 will be more important and hence placed higher in Google SERP than the webpage with Google PageRank of 3/10. How does Google determines a PageRank for any webpage? So Google takes into account the backlinks each webpage gets from different other webpages. Each backlink a webpage gets is considered as a vote by Google in the favour that webpage. But at the same time Google also analyzes the webpage from which a baclink is given. In the above figure A,B,C,D,E and F are different webpages. Here you can see that page C has got a higher pagerank than page E,even though it have fewer links as compared to page E. It's because of the importance of the page from which page C is receiving a link and also the number of outbound links from that page. In the above case as you can see page B has got most importance and is having only one outbound link to page C, so upto 90% of its PageRank is carried to page C.
In the essence, a page with higher baklinks from quality pages (those with higher pagerank) will have a better pagerank. Thus, improving your Google PageRank helps you by getting you more visitors through search engines and ultimately can result into a better revenue from your website/blog.